We are raising 60k in 60 days for our 60th birthday! We are almost there! We would like to take this opportunity to extend our sincerest gratitude to all our generous supporters who have brought us this far! THANK YOU! THANK YOU! THANK YOU! Since we are so close to our goal……. we are extending this matching opportunity into the New Year! With the busy holiday season now behind us, we hope that you will consider putting us over the top! With your support, your donations will match this Fund, raising $60,000 in the next 60 days to launch the Foundation’s next 60 years, which begin in 2015. Make your donation and your gift will be doubled by our Matching Fund. And, if you decide to give by becoming a Monthly Donor, your gift will be matched all year long in 2015! Double the impact of your contribution on the preservation of Quetico Park and the important education and research programs that the Foundation supports. Thank you for joining us at the Art Show! This year, our 60th anniversary year, The Quetico Foundation partnered with the Taylor Statten Camping Bursary Fund in Ontario Discovered, an Art Show featuring artists from the Quetico Artists in Residence Program alongside approximately 25 Canadian artists who are inspired by Ontario’s green or natural areas both within and outside the urban environment. 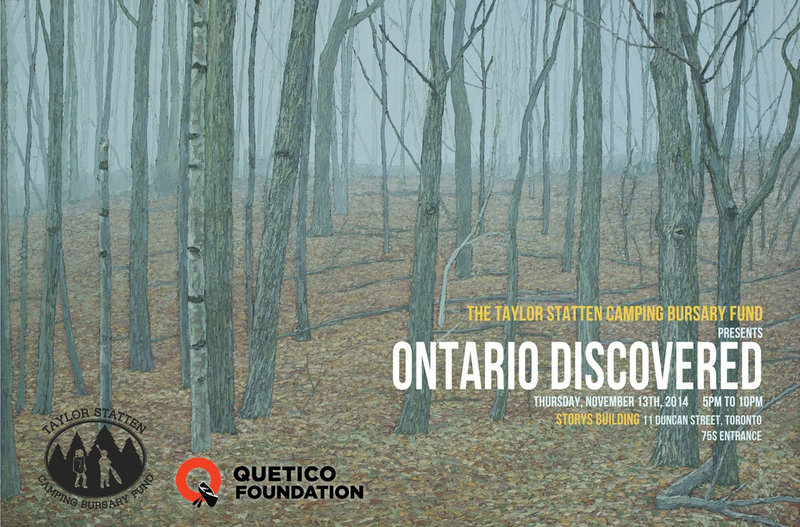 Thank you for supporting The Quetico Foundation and the Taylor Statten Camping Bursary Fund for a highly successfully, culturally rich evening. We’ll be posting a booklet of the art displayed at the show, some of which is still available! Visit this page again soon! It’s our 60th Anniversary Year—and we have a new website to celebrate! 2014 marks the 60th Anniversary since we were created by letters patent in October 1954! 60 years of wilderness preservation programs and initiatives! 60 years of ensuring that Quetico Park is the same today as it was 60 years ago! To begin commemorating our 60th Anniversary Year, we’ve launched this new website – a new look, a new feel, and new information. We’re excited to hear your feedback. Please send your comments to office@queticofoundation.org, fill out our form, or go to our Facebook page. Congratulations to Trevor Gibb who was appointed as the new Superintendent at Quetico Park effective March 17, 2014! We look forward to working with Trevor and his team in the coming years. The Quetico Foundation has made its official response to the Preliminary Quetico Park Management Plan, which was finally released for public comment on September 30th 2013. The Park Management Plan is the key document that sets the tone and direction for all aspects of the management of the Park for decades to come. Our comments are under consideration and the preparation of the final Plan is in process. We will post the final Plan here when it’s released.